Guests continue to discover the wonders of Loreto with new services and opportunities for adventure. Villa del Palmar at the Islands of Loreto is thrilled to celebrate its fifth anniversary this month, continuing with its mission to provide the best vacation experience possible for guests. Located between the majestic Sierra de la Giganta mountain range and the spectacular and pristine coastline of the Sea of Cortez, Villa del Palmar at the Islands of Loreto has continued to add to its list of authentic adventures, luxe amenities and unmatched hospitality since it opened its doors five years ago. This year, the resort is unveiling its new Danzante Bay Golf Course. Designed by Reese Jones, a world-renowned golf architect and “U.S Open Doctor,” the Danzante Bay Golf Course is a true rarity, featuring a mixture of stunning views and luscious green holes for golfers of all skill levels to enjoy. "There are not many golf courses that can offer a setting as beautiful and diverse as Danzante Bay,” said course designer Rees Jones. “The course winds its way up from the desert to the canyon and down through coastal dunes to the beach. Then it climbs up through the mountains, where a stunning cliffside par three overlooks the Sea of Cortez. This changing landscape allowed the creation of golf holes that are dramatically different from each other but combine to give the player a one-of-a-kind experience." With nearly 1,000 species of fish, anglers can reel in a world-class sport fishing experience and the opportunity to hook their next big catch. The resort’s tournament will begin June 29 and run through July 2, with a chance to compete for a $5,000 prize. Guests that are looking to relax can indulge in the resort’s 39,000-square-foot Sabila Spa and Wellness Center, which is set against a tranquil view of the Sierra de la Giganta mountain range, has fully-equipped wet areas with a soothing sauna, relaxing spa tubs, cold water plunge and more. To ensure that resort guests have a stress-free experience, Villa del Palmar at the Islands of Loreto made it easier than ever to check-in prior to arrival. A mere three minute process, guests can now check-in online, allowing them to bypass the front desk and head straight to their suite, the beach or their next great adventure. 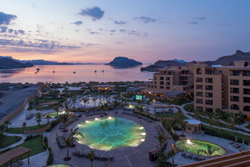 Last year, Villa del Palmar at the Islands of Loreto earned the coveted TripAdvisor Traveler’s Choice Award, and its first recognition as Mexico’s Leading Beach Resort by the World Travel Awards. This year, the resort has been nominated for its second year in a row by the World Travel Awards as Mexico’s Leading Beach Resort and also in a brand new category – Mexico and Central America’s Leading Resort. Votes can be cast at http://www.worldtravelawards.com/vote-for-villa-del-palmar-loreto-2016. The unrivaled views, private island feel and uncharted hospitality of the staff at Villa del Palmar at the Islands of Loreto have put the resort on the map as a haven for high-profile guests. Celebrities like E! News personality Maria Menounos, “Dancing with the Stars” star Karina Smirnoff, Sarah Hyland of “Modern Family,” Mayim Bialik of ”The Big Bang Theory,” rapper Lil Jon, Los Angeles Lakers legend Byron Scott, and others have vacationed at the resort throughout the past five years. But while the resort is a destination praised by many celebrities, it is also a getaway where families can receive the same exclusive treatment. Families looking for an outstanding vacation can experience exceptional service combined with many opportunities for family bonding time. Children looking to be pampered can relish luxury massages, facials, manicures and pedicures, while kids seeking adventure can take SCUBA lessons in shallow waters or explore the magnificent landscape through hiking, mountain biking, paddle boarding and more. Kids can also take part in Mexican artisanal activities, including craft making, cooking and wall painting. In celebration of the fifth anniversary, the resort is offering guests who book four nights in any room type up to $500 in various coupons, to be used toward 50-minute massages, manicures, full body scrubs and facials at Sabila Spa’s beauty salon, prime cuts or lobster dinner at Danzante Restaurant, a room upgrade upon check in, credit toward golf club rental, a romantic dinner set up, and more. The credits are available for travelers who book starting April 1 through April 15, for stays from April 1 to October 15, 2016. Other restrictions apply. Visit http://www.villadelpalmarloreto.com/promo/RC2016 and click on the flyer to book a stay, or call 800.790.4187 for questions.